In the mad, mad world of first-person shooters, weapon manufacturers are entirely unaccountable to any industry regulations, as they continue to present players with an astounding arsenal of ridiculous toys to experiment with. Despite their entertainment value, however, it has to be said that the more extreme variants of such weaponry are somewhat at odds with the foundational laws of science, mathematics and common sense. In fact, whoever came up with these physics-defying marvels clearly needs to be taught a lesson in basic ergonomics. If your tool of choice allows you to scrupulously take out everyone in the room with only a few bruises to show for it, well done. Your weapon is calibrated correctly. Alternatively, if it’s more likely destroy everything in a 300 mile radius, leaving only a steaming crater of ash and charcoal, then you best start looking for that receipt. There's a good chance you have one of gaming's most ludicrously impractical weapons. 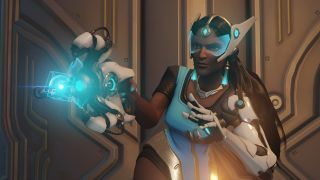 It’s fair to say that Overwatch's Symmetra is very much a fan of order and control, so it seems a little out of character for her to be using a weapon which holds the potential for unfathomable chaos. Her photon projector emits beams of elementary particles fizzing with electromagnetic radiation, allowing her to eat through enemies using the same energy which heats up her ready meals in the microwave. Even the slightest exposure to radioactivity can be catastrophic for a healthy human, even when seemingly contained by protective materials. There’s no telling how drastically the photon projector affects its user’s health in the long term, then, or even what it’s doing to anyone within the nearby vicinity. In short, shooting out giant balls of radioactive energy is a really irresponsible idea for a weapon, and I’ll bet it’s terrible for the environment too. A crossbow that fires super-heated, armour-piercing metal bars should be great fun. Even better is one which emits its red-hot iron ammunition with enough force to leave a bad guy's corpse dangling like a wet sock from a washing line. Half-Life 2’s drawstring weapon of choice is both of these things and more, not least because it makes a deeply satisfying “thunk” noise whenever it fires. But there’s a caveat. The crossbow’s metal bolts are heated by an electrical charge from the under-slung battery pack, but the weapon’s frame is made of metal and wood. I’m no physicist, but I feel obliged to warn Mr. Freeman that either the electric jolt should shock the user enough to involuntarily hurl the weapon skyward, or the frame’s instantly heated temperature will see it permanently fused to their skeletal structure as soon as they open fire. Frankly, Gordon, as one of Black Mesa’s top scientists, you should really know better. Whenever someone equates a near-impossible challenge to “capturing lightning in a bottle”, they’re speaking to an imperative truth. Electricity is one of energy’s most unpredictable participants, never more in its element when leaping from point to point like a frenzied ballerina. With this being considered, there’s certainly an element of plausibility to those lightning guns with shots that can chain onto other targets. But why should we presume that the user themselves are immune to the impact? Even assuming the gun itself is made of an electricity-resistant material, the average FPS hero’s extensive utility belt is sure as hell to be packing a lot of metal elsewhere. Bullets, for a start. I hate to be a buzzkill, but black holes really shouldn’t be used for the purposes of ammunition. You can’t throw it, and you probably shouldn’t throw it even if you could. It is made of gravity, after all. Quake 4’s example is even more egregious than the M-940 Blackstorm found in Mass Effect 2, as its featured “Dark Matter Gun” fires balls of energy which can pull any nearby objects into its throbbing epicentre. In Quake 4’s made-up universe, gravity apparently kicks in whenever you’re a safe distance apart from any reality-distorting disturbances. In the real world, the damn thing would yank your arm off as soon as you fired it. It’s best we keep assuming that the natural forces of the universe are on our side, because that’s precisely what Halo’s gravity hammer does. Let's ignore for a moment the absurdly top-heavy nature of the thing, which shows little regard for the laws of motion in its very design, and instead consider its damage output. The hammer generates a kinetic charge, the impact of which is a discharge powerful enough to knock a motor vehicle so far that, upon landing, the driver will need to learn a foreign language in order to ask anyone around what just happened. With those levels of damage, there’s no way that the shockwave would have no effect on the wielder. Conversely, those herculean downward strikes are fated to generate a kickback powerful enough to turn Master Chief’s shins into raspberry jam. Under normal circumstances, the peacemaker appears as nothing more than a bog-standard assault rifle. Activate its alternate mode of fire, however, and the gun launches every single bullet in its clip as one deadly cluster. The resulting shot is so hot that it instantly sears enemies down to the skeleton, reducing their bones to barbecue fuel within seconds. Based on theories of thermodynamics and human physiology, we might logically conclude that this effect places the cluster’s temperature somewhere between volcanic and atom-splitting. The force of expelling such a shot, then, would do much more than make the weapon briefly glow, as it does in the game. Instead, I can only imagine that the thing would do nothing less than instantly explode, spewing molten metal all over protagonist’s Grayson Hunt’s smug face. Simply put, it’s a rocket launcher which fires mini nukes (emphasis on the plural there). I would warn that even one nuclear bomb is enough to flatten the user and fry their skin to a radioactive crisp, but dealing with eight? Now you’re just trying to show off. Unless you keep a vast amount of nuclear ordnance on your person at all times, then you might as well forget this thing being useful on a regular basis anyway, or even an irregular basis at that. An expensive, unwieldy weapon which is just as likely to kill you as it is the poor fella you’re pointing it at - you’re better off just stocking up on Nuka Cola. The problem with an infinitely sharp sabre of bone-cleaving electron gas is that you have to be really, really sure where the blade’s edges are at all times. Spontaneous combat with this thing - hell, even carrying it across a room - would be nigh-impossible without inadvertently leaving bits of one’s own thighs and knees behind on the floor. As for the fact that the blades encircle the user's hand with about an inch to spare, how did that design flaw get past Covenant QA? This is to say nothing of the risk of hurriedly picking the hilt up from the wrong direction and slicing your arm off at the elbow the instant you fire up the blade. The fatality rate for Covenant military training programs using energy weapons must be sky high, not to mention the number of dropouts due to unintentional self-dismemberment. This one isn’t so much a problem of overkill as it is one of underkill, if such a concept even exists. You can forget all about Yoda’s talk of “size matters not”, because the pathetic kolibri pistol from Battlefield 1 is living proof of precisely the opposite. Yes, it’s cute, travel-friendly and great for showing off at dinner parties, but it’s also totally ineffective as a military weapon, delivering about as much damage as a low-grade pea-shooter. The primary purpose of any weapon is that it needs to be, well, weaponised, but the kolibri barely even passes this foundational criteria. If you try sporting this dinky antique in the trenches of Battlefield 1, you're a dead man walking.